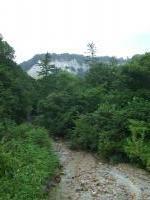 Shirakami-Sanchi is a mountain range covered with virgin temperate forest of Siebold's beech trees. This kind of forest once covered all of North Japan: Shirakami holds the largest remaining and most pristine stand. The designated area measures almost 17,000ha. Its highest peak is 1243m. The landscape is features deep valleys with steep slopes. It sees heavy snow during the winter months, something against which the beech trees are extremely resistant to. 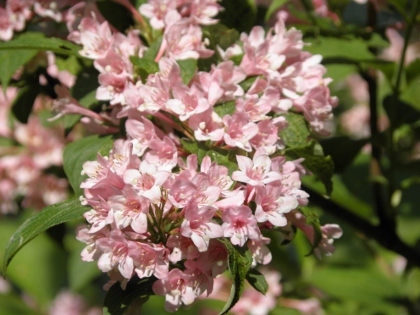 Its canopy is distinctively monospecific. The rare Japanese black bear (a subspecies of the Asian black bear) can be found here, as well as the Japanese serow and many species of birds and insects. There are no human residents or permanent man-made facilities in the core zone of Shirakami. Regional traditional bear hunters, the ‘Matagi’, spent weeks at a time in the forest during winter and early spring. Like all other reviewers so far, I did not get into the core zone of Shirakami. I am looking forward to hear from anyone who did – even a trip report to the Anmon waterfalls would be fine. It's located in the original buffer zone and presented that way in local maps. The WHC notes of 1993 seem to suggest that Japan put the buffer and core zone into one core area. To get a feel for the site, I combined a half circle around it on the JR Gono Line with a stop at Juniko. My train journey started in Hirosaki, just to the north of the Shirakami mountains. From this city one has the best view of the highest mountain peaks, which even in June are still covered with a lot of snow. I had a reservation on the “Resort Shirakami”, a special train that runs a few times a day during the season. It is quite comfy and has extra large windows so you can enjoy the views. They are not so great however when you want to take photos – there’s a lot of reflection. How I miss the Indian trains, that travel with their doors open and sometimes even don’t have glass in the windows! For the first hour we travel slowly from village to village, still in the civilised world. There’s a live music performance on board with traditional Japanese string instruments. Fortunately this ends after 15 minutes. After that the views start that make the Gono Line special: the coast of the Japanese Sea to the right, the Shirakami mountains and forests to your left. I found the coast actually more impressive to look at. It looks a bit like a British coast. After 2.5 hours I got off the train at Juniko. From there a bus took me further inland, higher up the mountain and deeper into the forest. Juniko Lakes lies adjacent to the buffer zone of the WHS. To my surprise I noticed at a map displayed at the entrance that the deep blue Aoike Pond even is so close that it looks like only metres away from the designated area. Anyway, I just enjoyed being here. The weather was great, nothing could be seen of the thunder and rain that was forecasted. I decided to hike from the top back to Juniko station, taking in the several sights under way. It took me 2.5 hours including stops and detours, I guess it is about 5-6 km. 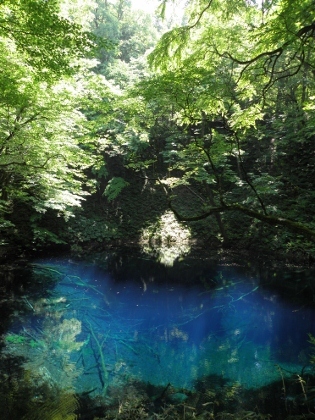 Aoike Pond at the top should not be missed, it is so abnormally blue. Further down there are larger lakes, the views to them mostly obstructed by trees. I guess some of them are the Japanese beeches, although the forest wasn’t nearly as “monospecific” as praised in the AB evaluation. Maybe the core zone is more so. I did find nuts on the ground however which are similar to those of the European beeches. A view not to be missed is that of Nihon Canyon. You can see part of it already from the main road driving up, but there are trails to better viewpoints too. The night before I had been dreaming about encountering a black bear when I was hiking alone on a trail. This was as much inspired by the stories of the Matagi as by this book about the Pacific Crest Trail that I had been reading before I went to sleep. And indeed I was alone on the first trail. I turned around quickly however, as I had reached a crossing of two trails and I had no idea which route to take. 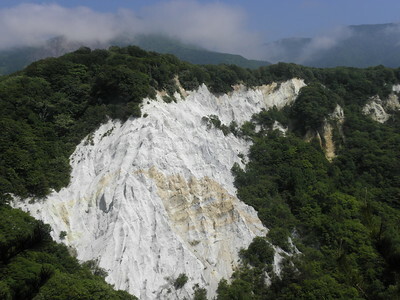 A better option came lower down the mountain, where there is a sign “Nihon Canyon – 0.5 km”. A man was walking in front of me, which made it even easier. The canyon is surely impressive, although it looks more like a ravine. Annoyingly there are pine trees and a wooden fence that block most of the views. After the man had left and I was alone, I crawled under the fence to take a couple more unobstructed photos. I did see my black bear further along the road: it was encaged and pacing back and forth. Probably it was caught here locally, but I don’t know what the purpose is of keeping it locked up and somehow on show. Back at Juniko Station, I completed my trip on the Gono Line with a local train to Higashinoshiro. The Shirakami mountains still visible to the left, but the views aren’t that great. 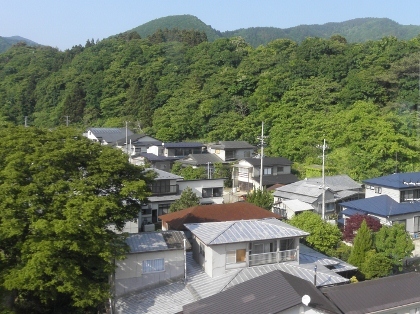 - Juniko can be reached by local trains and the Resort Shirakami Express. The last one only runs in season, and requires seat reservation. They don’t do seat reservations at Juniko station, so you’ll have to arrange your return journey beforehand (or just take a local train). - “Juniko station” is not much more than a bus and train stop, there is no village. - The bus across the road from the train station goes up to the Lakes. Buses leave about once an hour, and departures seem to match the arriving trains. A handy leaflet (partly in English) with arrival and departure times can be taken freely from a box at the bus stop. - The bus requires about 15 minutes from Juniko Station to its final destination, Oku Juniko Parking. This is near the Aoike Pond. The other sights are located lower on the mountain slope, and can be reached by walking or taking a bus back down. - There are coin lockers both at Juniko Station and at Oku Juniko Parking. They both also have vending machines, toilets and sell souvenirs and snacks. - The main signage is in Japanese and English, but when you want to hike a trail (even a small one like to the Canyon) it is wise to copy the destination down in Japanese or take a digital photo of it. At crossroads on the trails they seem to have forgotten the English, it’s easy to wind up at the wrong trail that way. - Even on a Monday in June there were lots of other tourists around, both by public transport and by tour buses. Most come to see the lakes however, traffic is much lighter on the hiking trails. My wife and I made it to the Amon falls in Oct and the foliage was at its best. The beech leaves were in all different hues of red and yellow. The walk along the stream to the falls on a sunny fall day was wonderful. Unfortunately you can only get to the first fall as the second and third falls are blocked from rock slides. There is a sign board and map in Japanese at the beginning of the trail with the UNESCO sign. To get there we rented a car from Sendai as car rentals in Japan is cheap vs train tickets for two people. The tolls on the other hand were terrible. It cost 7000 yen to drive from Sendai to Hirosaki. You can also see Hurazami along the way. For non native speakers, GPS is crucial and the way is to program is to punch in telephone numbers. In Hirosaki I went to the city hall and info center to get telephone numbers for Amon village and I was all set. One hour drive from Hirosaki. OK, so I finally made it to Shirakami Mountains in hot-humid early August. I chose to go to the Aqua Green Village area because I can at least enter the buffer zone from there. (I myself don't count in a WHS unless I set my feet within it.) I took a bus from the Hirosaki train station to the village. From the village there are two walking trails: one that goes through beech forest and the other that takes you to three water falls collectively called Anmon no Taki, both of which are in the buffer zone. I combined the two trails and walked on both, which only took me 100 min. It was a nice and rather easy walk. Since I had extra hour at the village, I soaked in a hot spring at the village to cleanse myself off sweat. I happened to go to Heinrich National Park in Germany just last year, which is also a WHS for its beech trees. Folks at the World Heritage Center at Shirakami told me that the beech trees at Shirakami are supposedly more ancient. I just want to correct what I said below. Although a map I acquired online from the WH center at Shirakami Sanchi clearly shows that the summit of Mt. Shirakami is within the core region of the WHS, I just called the WH center to clarify the matter because I had some doubt. They said that the summit is on the border between the inside and the outside of the core region. What does that mean??? I don't know. They also said that you need a permit to enter the core region. There is one way to enter the core zone of this WHS, and that is to climb Shirakami Dake, or Mt. Shirakami. You can do so from the train station of "Shirakami Dake Tozan Guchi," which means "Entance Point to Mt. Shirakami." This hiking trail is in fact quite popolar among the Japanese. Also, there is no such thing as Shirakami Sanchi National Park. This area is part of Tsugaru Kokutei Kouen, or Tsugaru National Monument. Currently the single natural World Heritage Site in the region of Tohoku or Northern Honshu, Shirakami-Sanchi is the name of the inaccessible beech forest mountain range in western Aomori Prefecture and Northern Akita Prefecture. I used the word 'inaccessible' because the inscription area is almost impossible to enter as there is no road or tourist facility at all, there is only one place that is really in the core zone that opens to public which are the Anmon-no-taki Fall. All the tourist centers and museums which other reviewer mentioned as well as the the Juni-Ko area and its nearby hiking trail to Shirakamidake Peak are also outside the World Heritage Site! Since I visited the area in March, all the hiking routes as well as the Anmon-no-taki were closed due to heavy snow. I had no choice but have to use the most popular option of all tourists in order to see the mountain, a train. There are two rail lines that can provide a view of Shirakami-Sanchi Range; the first one is the Gono Line with spectacular view of whole range and Japan Sea, the second one is Ou Line with view of beech forest inland valley. I took both lines and found out that while the Gono line was very impressive with Mountain View, the view from Ou Line was very pretty similar to Black Forest in Germany. Since train riding was very time consuming so plan carefully for all connections, also better to buy the food from Aomori or Akita train station in advance, and don't forget to buy mineral water from Shirakami-Sanchi Range from the vending machine, a good souvenir. Another recommendation is the Furofushi Onsen near Henashi Station on Gono line, this place is just amazing with hot spring tub next to the sea, and the view is fantastic. Even though I did not visit the core zone of Shirakami-Sanchi, I really enjoyed my trip in the area with great view, delicious food and lovely hot spring, a perfect place for vacation. I found the most convenient way of seeing the Shirakami was from the train that runs along the narrow coastal strip from Fukaura south to Noshiro. From its windows I saw the passing panorama of the rocky coastline on one side and the seemingly impenetrable beech clad mountains on the other. I travelled up and down this line several times, getting off a small stations. One station was called Juniko, and from here I took a bus that travelled inland to the Juniko Lakes area. From here walking tracks led into the Shirakami Sanchi National Park. I really enjoyed my trip to shirakami-sanchi in aomori-ken. it was quite difficult to find information on it, and public transportation is really complicated. but the virgin beech forest is quite spectacular. rent a car because public transport only allows for a very limited time in the forest. i really enjoyed the informative shirakami-sanchi museum (in english and japanese) and the free (something free in japan? yes!) imax movie about the beech trees (in japanese only). but the best thing about the experience was its isolated locale. sure, there were tourists hiking and taking pictures, but it was relaxing and so green. there are many onsen in the area as well. IUCN had pleaded for referral, because of integrity issues. Traditional Hunting: Bear Hunting by "Matagi"